Get outdoors at Dolphin & Whale Watching and Swan River. Satisfy your inner culture vulture at Fremantle Prison and Art Gallery of Western Australia. Change things up with these side-trips from Perth: Fremantle (The Shipwreck Galleries, Western Australian Maritime Museum, & more), Caversham Wildlife Park (in Whiteman) and Penguin Island (in Rockingham). Pack the 6th (Thu) with family-friendly diversions at Adventure World Perth Australia. Dedicate the 9th (Sun) to wine at some of the top wineries in the area. 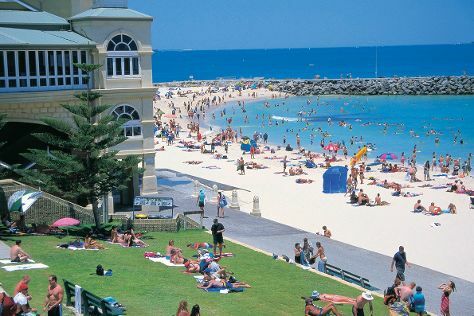 And it doesn't end there: kick back and relax at Cottesloe Beach, snap pictures at Elizabeth Quay, contemplate in the serene atmosphere at St. Mary's Cathedral, and appreciate the history behind The Bell Tower. To find ratings, traveler tips, reviews, and other tourist information, refer to the Perth trip maker website . If you are flying in from Singapore, the closest major airport is Perth International Airport. In June in Perth, expect temperatures between 23°C during the day and 9°C at night. Finish your sightseeing early on the 9th (Sun) to allow enough time to travel back home.